Sabrina is a native New Yorker born and raised in Long Island, NY. She was a competitive gymnast growing up and selected the University of Florida to continue her gymnastics career, however an injury kept her from competing for the University. Sabrina did still stay involved in athletics at the University of Florida by interning as a Strength and Conditioning Coach for the UAA. She was also a member of the women's club lacrosse team, competed for the Florida Elite All-Star Cheerleading squad, and performed in the Nutcracker with Gainesville's Professional Dance Troupe "Dance Alive!". She was also a member of the Kappa Kappa Gamma Sorority. Sabrina graduated with a degree in Exercise and Sport Science and a minor in Dance, and also became certified as a Strength and Conditioning Specialist through the NSCA. Upon graduation Sabrina moved back to NY, and eventually to New Jersey where she currently resides. After going back to school to receive a post-baccalaureate teaching certification, Sabrina became a physical education and health teacher at a high school in New Jersey, and has coached both gymnastics and cheerleading for the high school. Sabrina was even named the 2014 Gymnastics Co-Coach of the year for New Jersey's North Section 2 by the Star Ledger. Outside of work, Sabrina enjoys running, working out, and taking dance classes. She also bartends on weekends, a hobby that started in Gainesville. Sabrina has since bartended throughout NYC and Hoboken, including game watches at the old UF Alumni favorite, The Town Tavern, and now bartends on the Jersey Shore during the summer. 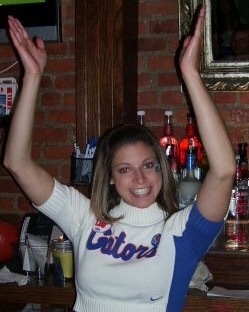 Sabrina also loves football and come fall you will find Sabrina cheering on the gators at Sidebar. Sabrina is very excited to become more involved with the Gotham Gators as a VP of Viewing Parties.